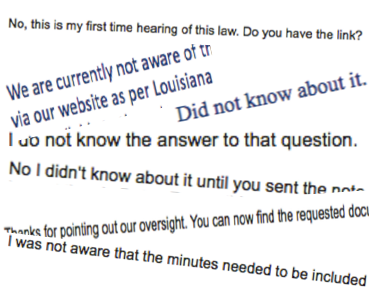 Until The Lens investigated last month, only a handful of charter school boards in New Orleans were fully complying with a two-year-old state law that requires public bodies to post their minutes online, or an older law that requires the same for their agendas. And even now, as most work to comply, few are completely falling into line with amendments to the state Open Meetings Law that legislators made in 2012 and 2014. The Lens this summer examined the websites of the 40 Orleans Parish charter school boards, which run 81 schools in the city, to gauge compliance. The posting of these official documents is more than a technicality or an administrative requirement. Few news media outlets are able or willing to commit the resources necessary to cover the meetings of these publicly funded boards, which collectively manage hundreds of millions of taxpayer dollars. Few parents attend these meetings. The minutes are one of the few ways to easily keep track of a board’s actions. Even for some school boards that post the documents, the minutes lack basic information required by law. And regarding a third, more recent law that went into effect just at the beginning of the month, fewer than half listed their official custodian of records. That’s the person responsible for providing public records to those who request them. Transparency and good government were why the Louisiana Legislature updated the Open Meetings Law, said Rep. Neil Abramson, (D-New Orleans), the author of the 2014 bill. He said he wouldn’t be surprised to hear if other public bodies were failing to post official accounts of their meetings. When we first looked, seven of the 40 school boards regularly were posting minutes for their full board meetings. But the law requires the same posting for committees, and only a few had those. For the boards that have formed committees — nothing requires public bodies to do so — much of the substantive discussion takes place in those smaller meetings, and full boards usually approve their recommendations with little discussion. The law requires the boards to keep the minutes posted for at least three months. The Lens emailed the 33 fully non-compliant boards for explanations. Some blamed website revisions or other technical issues, others said they weren’t aware of the law and others offered no reason or didn’t respond. Within two weeks, 30 boards posted their full board meeting minutes to their websites. However, none included committees, though some have recently begun to do so. Andrew Shahn, the ARISE Academy principal, said their latest minutes were not posted because they were written by hand instead of electronically. A few boards, including those of the Algiers Charter School Association and Friends of King, declined to comment. The Community Leaders Advocating Student Success board, which governs Fannie C. Williams Charter School, never responded to several calls or emails, but its site was among those quickly updated. The head of the Greater New Orleans Collaborative of Charter Schools, which includes 12 schools in the city, said its boards “just weren’t aware” that the law was amended two years ago to require posting meeting minutes online. He was referring to notices that regularly go out from the state that summarize new legislation regarding charters. After the 2014 legislative session, the Department of Education emailed to all schools a summary of the legislative changes. It didn’t note this change but cautioned that the list wasn’t exhaustive. Still, schools received a clear notice from a statewide trade group for charters. The Louisiana Association of Public Charter Schools updated its legal handbook in 2015 and sent copies to its members, both paper versions and by email. It included news about the minutes amendment on the first page. For the Orleans Parish School Board and the Recovery School District, Ducote’s organization clearly supports the idea of early notices and meeting recaps that are accessible to the public. For years, it has produced the OPSBrief and RSDigest, two email alert newsletters with agendas and summaries of those meetings. They’re designed to make school leaders and community members who could not attend meetings more aware of policy changes. The briefs are meant to be quick and understandable to the average person, Ducote said. Of the school boards who did post their minutes either before or after our investigation, less than half had documents that fully meet basic state requirements to include the meeting’s location and which members were present or absent. Three schools have still not revised their websites to provide board meeting minutes after we alerted them last month: Robert Russa Moton Charter School, Lake Forest Charter Elementary School and Einstein Charter School. All three are chartered and overseen by the Orleans Parish School board, and all are part of Greater New Orleans Collaborative of Charter Schools. A spokeswoman for the collaborative said because it is summer, it may take a couple weeks before they return from break and update their sites. A handful of schools that posted their required minutes after our alert failed to continue posting their meeting minutes throughout the rest of the summer, despite having more meetings. The board of New Orleans College Preparatory Academies, too, had all the minutes posted from the board and committees. However, the minutes didn’t have some of the legally required information, including who was absent from the meeting. The only other board that may have been in compliance was the Friends of King school board, which oversees Dr. Martin Luther King, Jr. and Joseph A. Craig schools. The Friends of King board last met in March, so they wouldn’t be required to still have those minutes posted because it’s past the three months called for by law. We also found only a little over half of the boards apparently posted meeting agendas on their sites, as state law from 2012 also requires. The agendas must be posted at least 24 hours before a meeting, excluding weekends and holidays, but there’s no requirement that the agendas remain available after the meeting. School boards don’t have a meeting quota, but the state Department of Education recommends meeting once a month. We found that about half the boards meet monthly and most other boards meet every other month. Further, The Lens found that more than half of the charter school boards were not compliant or aware of two new website-related laws that went into effect Aug. 1. One law requires information about custodian of records be easily accessible online. The other requires that every public school post the state child protection toll-free hotline number on its website. The state Department of Education sent a summary of new laws, including these, to all its charter schools in early July. The Orleans Parish School Board forwarded it to its schools, along with a similar summary written and distributed by the Louisiana Association of School Boards, a few days before the laws went into effect. The Louisiana Association of Public Charter Schools plans to send schools another alert about the latest changes. Again, many boards offered the same reasons for the lack of information, and again, may quickly moved to include the information on their sites. However, some didn’t respond and still don’t provide the information. Webber said she was not familiar with schools sites being noncompliant. During a recent phone interview, she was leaving an informal education leadership meeting with local community organizations where they discussed increasing school awareness of laws that affect them. Webber said those responsible for providing that information to schools know that they need to “do a better job” of informing schools about new policies by ensuring the “layperson” can easily understand and quickly hear about them. “As a system, we all have some work [to make sure] everybody knows what their responsibilities are,” Webber said. *Correction: An earlier version of the story did not point out that Crescent City Schools and FirstLine Schools board of directors are in compliance with all the laws we checked on.